Scott’s girlfriend, Leslie, was a power user of the popular Mom community site CafeMom. 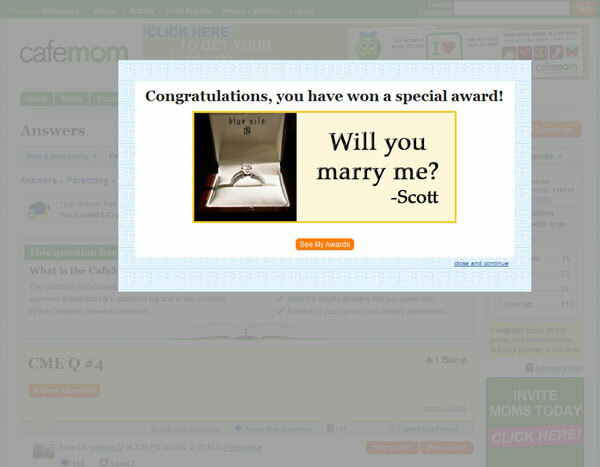 Scott sought to enlist their help in crafting his proposal to her through their popular Achievement Awards program. “I have a dilemma, and I was hoping your staff might be willing to accommodate a unique request for a one-of-a-kind feature. My girlfriend is a regular user of your site, spending hours of her time every day on the Answers section. I recently purchased a ring, and I am planning to propose to her. I would like to ask if you will work with me to create a memorable experience for her. I understand that you have “Achievement Awards”, which she strives to collect, and checks on a regular basis. I was thinking of a “Will You Marry Me” achievement that I might be able to activate from a unique URL at any given time. Cafe Mom staff member, Brian Craine, brainstormed a way that Cafe Mom and Scott could orchestrate the proposal. Craine and other staff set up a special “award” that would trigger the Saturday evening that he was planning to propose. They did this by adding an object into the code that said if the user was to answer a question after any time on that afternoon, the “Will you marry me award” would pop up. The award incorporated an actual photo of the ring that Scott was to present to the lady in question. There you have it, kids – the power of the internet being used for good. How awesome is that?